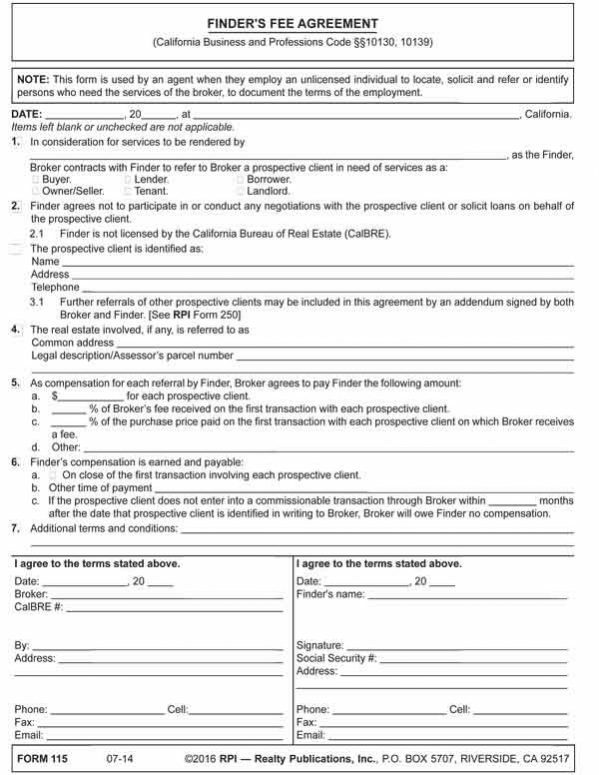 This form is used by an agent when they employ an unlicensed individual to locate, solicit and refer or identify persons who need the services of the broker, to document the terms of the employment. Employed individuals generate business for the broker and their agent and thus are paid for that activity. However, the finder employed by a broker is limited to locating and soliciting new clientele for the broker or their agents. Anyone may be a paid finder, unless barred by professional regulations, codes of ethics or conflict-of-interest policies controlling an individual’s conduct. Thus, when not employed by a broker, a finder may advertise as a “referral service.” The finder may state they will place an interested party with a broker or principal, or refer a principal to a match sought for a real estate transaction. The distinction exists between the sharing of fees by brokers — also known asfee-splitting — and the payment of a finder’s fee to an unlicensed employee of the broker. When a broker shares fees with an individual who is not in the employ of the broker, the broker may only share their fee with another licensed real estate broker. For a broker to pay a finder’s fee for an unlicensed referral service, the individual must be under contract with the broker as an employee. This may be a one-off situation based on a single referral by the referral service. Article: Can a finder’s fee be paid to non-licensee?